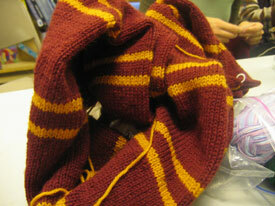 Amber's finished her Prisoner of Azkaban scarf (and just 13 months before the next movie comes out)! It looks awesome on her. 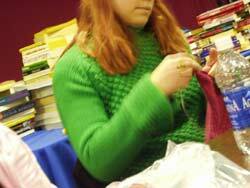 And next she's starting the cover sweater from Spring 2006 Interweave Knits, Bobble Blue, except in green instead of blue and without the bobbles. 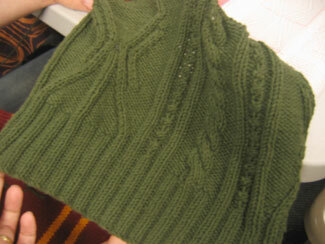 Oooh, all seasons cotton looks soooo nice with cables! 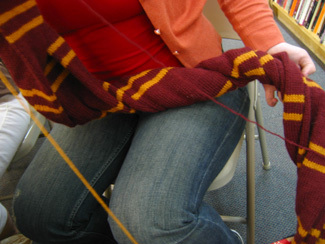 Amber's still not done with that Prisoner of Azkaban scarf! The Brown Sheep Naturespun yarn looks awesome though. 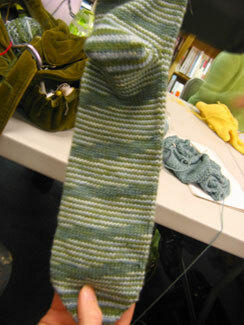 Last week, Amber brought green socks. 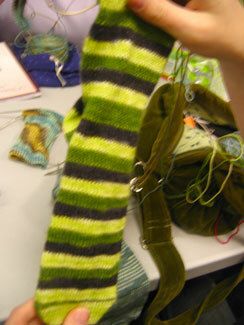 She's got Sunshine Yarns green stripes underway for herself. 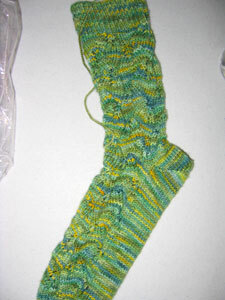 And ultra-long Ultramerino socks for her dad. Yes, that is the foot! 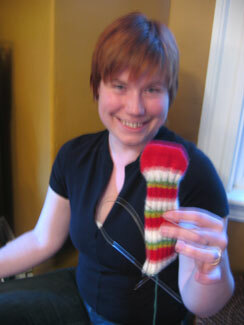 And she couldn't stop giggling about what her watermelon toe-up sock looked like. 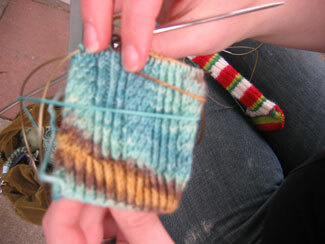 Amber is working on embossed leaves socks in a beautiful Koigu colorway. 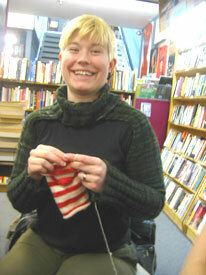 Amber is working on a Dale Finnskogen sweater for the Knitting Olympics. It's for her hubby, who chose the pattern. And lookie, Amber spins! 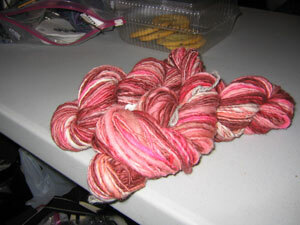 She brought in some really beautiful variegated rose colored yarn she spun and is going to give to Dana for her birthday. 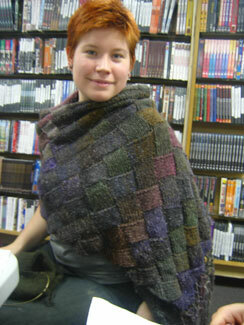 Doesn't Amber look stunning in her new Entrelac shawl from Scarf Styles?! 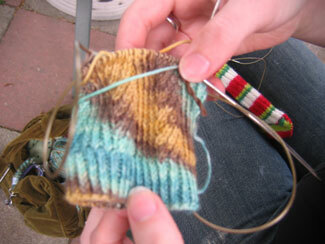 Hip knit shrug, cool sock-in-progress, and a new haircolor - that's Amber! 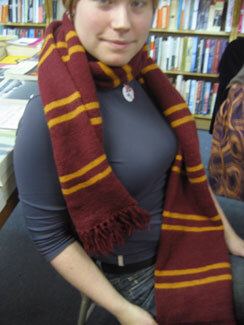 This week Amber brought in her Harry Potter: Prisoner of Azkaban scarf. Love the colors of that Nature Spun! 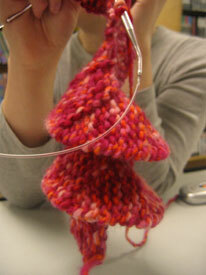 And this fun twisty scarf (done with garter stitch short rows!) for a niece. Cables in all seasons cotton. 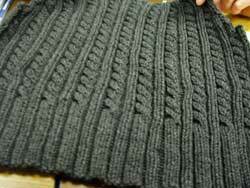 Look at that stitch definition! I'm in love again. Thanks, Amber. 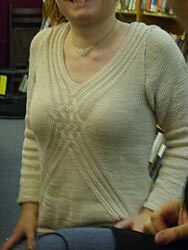 Ooooh, it's Amber's Dale Tuja sweater. 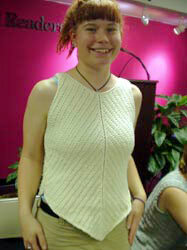 Amber's back at Knitsmiths after her exciting vacation and she's got a couple of great finished tanks to show off. A chevron tank in Blue Sky Organic Cotton (free pattern online from Interweave Knits) and a fabulous low-cut tank in Rowan Summer Tweed. Looking good, Miss (um, Mrs.!) Thang. Don't you just want one of these? Amber's new sweater is so great! Psst - she bought it. 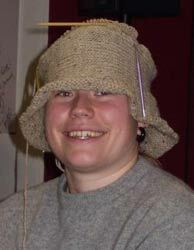 But now we all want to knit one just like it. Hear that, Kerstin. Amber's making a ChicKnits' Bucket o' Chic for her dad. It's humongous!